I missed the excitement of the Winter Magic Festival in Katoomba because I was working but as I am not great in crowds it was no great loss. Instead, on Sunday I travelled up the highway with the young lad in tow for the Magic Festival at the Carrington Hotel. My ulterior motive, of course, was knitting and I used the School for Wizards as an excuse to get him out of the cosy warmth of the house to meet up with a small, intercity and interstate group at the Blue Mountains Chocolate Cafe. I was only able to stay for an hour or so because of the limited entertainment that the cafe had for a 9yr old boy (other than the destructive possibilities of the wax candles used to heat the chocolate) but it I still had a lovely time. 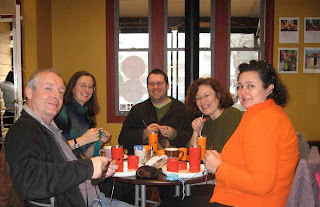 There was talk of blogs, podcasts, science fiction and fantasy and of course, knitting. David is working on his 127 Filatura Di Crosa Jumper in a rich chocolate shade(very apt) with purple and blue highlights ; Trudi is holding her Aqua Green handspun scarf in mistake rib and wearing a beautiful sweater she knitted in Naturally Vero; Mark is making good progress in Noro Blossom (not Bottom as I misheard) on the same Berkshire Jumper from Weekend Knitting that I have just completed and I think Lara has a hat in stripey sock yarn. As for me - I was adding several inches to the sleeves of my Berkshire Jumper that was a really quick knit in the 14ply Cleckheaton Tempo (unfortunately discontinued). I love this yarn - it knits fast and goes for miles. Even after finishing the large pullover for the dad I still have enough balls left over to make a junior version of this pattern for the son. I was sorry to leave so early but the mist was starting to draw in and a Diorama of Mars had to be completed for School so I stocked up on Chocolate rats and Chilli Bombs and we headed home. Thank you to David for coordinating the get-together. I had a great time and it was lovely to meet you all. The rat is very tasty, and I'm afraid only his midriff is left now. Been slowly gnawing at him from both ends. Mustmustmust get back to that cafe for one of those hot chocolates now I'm well enough to consume one!